Do not miss Audubon’s Aviary: Part I of the Complete Flock at the New York Historical Society. Running from Friday, March 8 through Sunday, May 19, this is the first installment of a three-part exhibition that will stretch over three years and feature all of John James Audubon’s 474 original watercolors, along with nearly as many study pieces. These paintings, which the NYHS acquired 150 years ago this spring, were the basis for the hand-colored engravings that made up the double-elephant folio Birds of America. “Once-in-a-lifetime” is not an overstatement when describing this exhibition. Although the NYHS has shown these paintings many times, and in many different groupings, never before has it displayed the entire collection as it is doing now. Even more exciting, curator Roberta J. M. Olson decided to organize the birds in the order they were printed and delivered to subscribers. That inspired organization allows visitors a better understanding of Audubon’s business sense – and showmanship. Although Audubon’s subscribers agreed to buy the entire set of prints, which he produced in groups (or fascicles) over twelve years, they could cancel at any time – and some did. Audubon realized that he needed to keep his subscribers engaged and eager for the next fascicle, so each delivery included one large print, one medium, and three small, a mixture of the more spectacular birds along with the more ordinary. And, that’s how the birds are displayed in the NYHS’s second floor galleries, a space transformed into a painted aviary: birds in flight, birds at rest, birds nesting, birds feeding – birds everywhere. Complementing the paintings are media installations (heard via hand-held devices) that draw correlations between the birds in art and in nature. Down the hall, the history-minded can find some pieces of Auduboniana in a small, comfortable room. Among the documents is a letter Lucy Audubon wrote to Frederic De Peyster, the president of the NYHS in 1863, when she was negotiating the sale of her husband’s paintings and accompanying studies. That letter is a timely reminder of Lucy Audubon’s role in ensuring that her husband’s visual legacy would be preserved and maintained. History has treated Lucy well. Audubon biographies and surveys of his work routinely portray her as a selfless helpmate whose sacrifices and industry enabled the naturalist to pursue the labors that resulted in his masterpiece, but Lucy Audubon was far more complex than that – and for the most part far more self-absorbed. Her negotiations to sell her husband’s paintings to the NYHS, recorded in correspondence in the Society’s library and in the New York Public Library, reveal an extremely clever and resourceful businesswoman. They also reveal a woman who was determined to ensure her financial independence even if that meant shading the truth or disparaging members of her family. Far from being sentimental about the paintings, or as she called them the “drawings,” Lucy clearly considered her husband’s art as her rightful inheritance, a commodity to be sold to the highest bidder. Lucy opened her negotiations with the NYHS in December 1862 when she contacted the librarian George Henry Moore, to test his interest in the drawings. After a sentimental salvo about her husband’s wishes and a well-placed hint that she had other potential buyers, she named her price: $5,000 (approximately$115,000 in today’s buying power). She also offered to sell “the coppers” (the copper plates the engraver used to create the prints) and informed Moore that if she could not find a buyer, she would sell them “by weight as old Copper,” that is, they would be melted down. While that seems an ignominious fate for the plates used to create her husband’s masterpiece, Lucy had learned that the plates deteriorated over time, so they would eventually be useless. In the midst of her letter, Lucy referenced a theme she would repeat in various forms throughout the negotiations: the proceeds from the sale would “relieve the orphan and widow,” a somewhat deceptive phrase that we’ll investigate in more detail further on. The mortgage in question was an obligation of $20,000 on the house Audubon had built in 1841 and deeded to Lucy, along with the 14-acre farm, Minnie’s Land. Lucy hadn’t lived in her house since about 1853 when Victor and John W. had built houses for their families adjacent to the original Audubon house. Instead, she leased her house and lived six months of the year with one son and then the next six months with the other. At the same time, she was collecting rent from another house she owned, this one in the north-west corner of the farm, just north of her younger son’s home. Despite that solid income, Lucy was constantly worried about supporting herself and her family; those worries only increased after John W.’s death in 1862, which is when she once again began exploring the possibility of selling the drawings and coppers. Before proceeding further with the narrative, we should stop a moment to consider what Lucy meant when she referred to “her family,” as that definition is important for understanding her correspondence related to the drawings. John James and Lucy Audubon had two daughters who died in infancy and two sons who lived to adulthood. The sons each married twice (both of their first wives died of consumption while still in their 20s), and between them had 16 children, 14 of whom survived childhood. 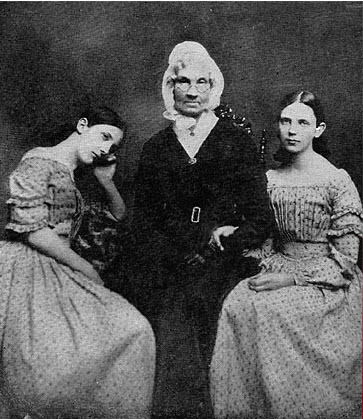 Among her grandchildren, Lucy Audubon had a very special relationship with the two eldest, Lucy (Lulu) and Harriet (Hattie), who were John W.’s daughters by his first wife. When their mother died, Lulu was a toddler and Hattie an infant. Claiming that it was her daughter-in-law’s last wish, Lucy raised the two girls as her own children, substituting them for the two daughters she had lost decades earlier. While Audubon was alive, the entire family had lived as one unit in the original house, but after his death in 1851, the family began splitting into three distinct units. That split increased when Victor and John built their own houses and then became even more pronounced after John W. died and Lucy focused increasingly on the welfare of her family unit: Lulu, Hattie, and herself. When Lulu married Delancy Williams in 1858 and moved to her husband’s farm, Lucy’s family unit shrank to two. From then on, Lucy (the widow) and Hattie (the orphan) were a modern-day Naomi and Ruth; whithersoever Lucy went, Hattie followed. While both of Hattie’s parents (John W. and his first wife Maria) were indeed dead, describing her as an orphan is a bit misleading, given that in 1863, while the negotiations with the NYHS were ongoing, she was 24 years old and had been earning an income as a music teacher for several years as well as earning additional income playing the organ at the Church of the Intercession. She was – and remained into her 90s – a very independent woman, much like her grandmother. Between 1851 and 1854, Lucy and her sons had sold the majority of Minnie’s Land. All that remained for the Audubons were the two houses where Victor and John W. lived, the two houses Lucy owned and was leasing, a rental house that belonged to Victor and his wife Georgianna, and the lots accompanying each of those houses. The transformed farm, now a rural suburban enclave of about a dozen villas, earned a new name: Audubon Park. Although Lucy would claim during her negotiations with the NYHS that she had given her property to her sons “to pay debts compiled by them in unsuccessful businesses” and so that they could build houses and raise money through mortgages, the City Register tells a different story. All of the transfers between Lucy and her sons had dollar values attached; Victor and John W. paid their mother market value for the parcels. Even more distressing is reading correspondence between Victor and John W. (while Victor was on the road selling subscriptions to the Quadrupeds of America) and realizing that their objective with these business deals was raising a substantial sum of money they could invest to provide Lucy with a lifetime annuity. One other item that Lucy mentioned in her negotiations bears elucidation: her school. George Bird Grinnell, as well as others in the generations following Lucy Audubon, passed along the story that in the difficult years following Audubon’s death, Lucy Audubon ran a school and used the proceeds to support her family. This myth has been repeated as fact in numerous accounts, but under a bit of scrutiny, doesn’t pass the test of logic – unless we understand it within Lucy’s definition of family. Numerous references in the Audubon correspondence from the 1840s and ’50s confirm that Lucy ran a school for the purpose of educating her grandchildren, who made up the largest number of her students. The others, whose parents paid nominal fees of $5.00 to $10.00 per pupil per quarter, accounted for only a few of the students in Lucy’s classroom. She could not possibly have earned sufficient income from those few pupils to support the large Audubon family (plus the servants she insisted on having) for a month, much less sustain them over several years. And, even if she had charged her sons to teach her grandchildren, what would have been the sense of then using that money to support her sons and their families? Here again, we must return to Lucy’s definition of family. As she explained to Mr. McPeters, who duly reported to DePeyster (February 24, 1863), “For her own support, consequently Mrs. Audubon was obliged to undertake the teaching of some of the children of the vicinity, assisted by an orphan Grand daughter.” What was true in 1863 had also been true in the 1850s; the income from the school supported Lucy, Lulu (until she was married), and Hattie. Further, although Lucy told McPeters that she ceased teaching because “her strength entirely gave way,” she had told Burgess the previous March that despite trying, she had not been able to get any scholars. By 1862, when John W. died, Lucy’s saleable assets had dwindled significantly. Even so, in March, she replied to a letter George Burgess had sent her about writing a will. Her first concern was Hattie, her second was Lulu, and then, whatever might be left could go to her other 12 grandchildren. 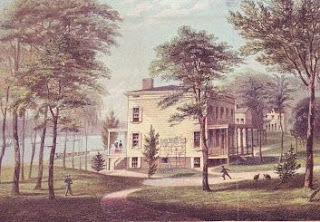 (The “lot and well” in the letter refer to the original Audubon house, though in 1862, Lucy also owned a small lot west of present-day Broadway and the spring that originated there. She would sell that parcel along with the house and land, in 1864.) When Lucy did die, more than a decade later, she left her entire estate, much diminished, to Hattie. I do not know what I can say about a will when I know not if I shall have anything to leave, but under existing circumstances I think if I leave all personal property, except Books and Pictures, to Harriet, along with the “lot and Well”, the Books and pictures to be divided between the two Sisters Lucy and Harriet. Then such an amount out of what I may have; as my Executors shall deem necessary to make Harriet quite comfortable, if such there be, and whatever there may be left after that; to be divided equally amongst the other Grand children as may be living at the time of dividing my property, be it what it may. In April 1862, when Lucy began corresponding with George Burgess about selling the copper plates, she was both concerned and indignant because “Mrs. John [John W.’s widow Caroline] says I have no right to them.” In June, she considered writing her remaining contacts in England to inquire about interest in the paintings there and by July, she was considering selling the drawings for $3.00 a piece, which would have yielded only $1,200 ($27,700). In November 1862, Lucy sold William Wheelock the house he had been leasing on a yearly basis for $13,000 ($300,000), seemingly a small fortune, but not enough to assure Lucy that she and Hattie were financially independent. What seemed to bother her even more than her debts was the interest on the mortgage, because it was money she was paying without any visible return. By December, the negotiations with the NYHS were in full swing and Lucy was updating Burgess on her progress, telling both him and Frederic DePeyster that the British Museum, the King of Portugal, the Prince of Wales, and “friends in Philadelphia” were all interested in purchasing the paintings. While this was not a complete bluff, she may have been exaggerating (or imagining) the interest, since she ultimately did not sell to any of them and never mentions concrete offers. Of all the letters in the series, the most revealing is the one “Mr. McPeters” wrote to Frederic De Peyster on February 24, 1863, after an interview with Lucy Audubon. In it, McPeters reports Lucy’s claims about her sons unsuccessful businesses, her school, her financial “embarrassments,” and her supposed generosity. That generosity is not confirmed in any other sources, including Lucy’s own letters or the public record, which record that her sons paid her for every parcel they received in Minnie’s Land. The numbers McPeters quotes in the letter are interesting and suggest Lucy was fudging a bit to make her condition seem direr than it was. The total indebtedness she reports is a $20,000 ($370,000) mortgage on her remaining property. Lucy then reported that “by parting with one piece of property” she had reduced her indebtedness to $12,000. When Lucy she sold her house and land to Jesse Benedict in 1864, she received $24,000 ($354,000 – again note the fall in the value of the dollar) and immediately paid $12,000 for the outstanding mortgage, so that sum is accurate. What doesn’t calculate is that in November, she had sold her smaller rental house and the land around it to William Wheelock for $13,000. If she had reduced her $20,000 debt to $12,000, $5,000 is unaccounted for. Granted, she may have used it to repay old debts or taxes, but it might as easily have gone into Lucy’s nest egg. Coincidentally, $5,000 was the amount Lucy had originally named as her price for the drawings. By April, Lucy was quite frustrated with the lagging negotiations and seeming lack of interest from the NYHS. She wrote Burgess on the 9th that her view of the society was very much in line with his – the suggestion being that neither of them thought highly of it. On the 10th, when she wrote to DePeyster, she switched from her “widow and orphan routine” to irony, “It is somewhat singular that my enthusiastic husband struggled to have his labours published in his Country and couldn’t; and I have struggled to sell his forty years labour and cannot.” In the same letter she strongly hinted that she was packing the paintings to send to England, which being the practical individual she was, she probably would not have done without a firm offer and at least a down payment. Her ploy worked, however, and on the 12th, she wrote to Burgess that Shepherd Knapp, a neighbor just north of Audubon Park, had visited the previous evening to tell her that a committee of 15 “Gentlemen of the Historical Society” had joined “to try and raise the money” to buy the paintings. Soon, a circular appeared for just that purpose. Among the signers were Knapp and Daniel F. Tiemann, former mayor of the city, state assemblyman, and long-time friend of the Audubon family. With the circular, these gentlemen signified their intention of raising $4,000 ($74,000) to purchase Audubon’s drawings. A couple of weeks later, when the funds had not materialized, Mr. McPeters visited Lucy again, telling her that the NYHS would be happy to buy the paintings, but needed more time to raise the funds. Lucy wrote DePeyster and complained that she was surprised by the delay given that wealth was so “abundant” in New York. She followed that sentiment with a lament that during the months she had been negotiating with the NYHS, she could have been liberated from her “pecuniary embarrassment and England in possession of the Drawings.” Lucy may have shot herself in the foot with that remark. DePeyster probably realized that if anyone in England had really made a firm offer for the drawings, Lucy would have sent them long since and he would have relieved of her tedious letters. Whether DePeyster was trying his own bargaining tactics or whether he was conveying fact, when he reported to Lucy that the NYHS could only raise $2,000 on subscription ($37,000; due to the falling value of the dollar during the Civil War, if Lucy had sold the painting for this amount a year earlier, the buying power would have been $46,000), she accepted the offer and surrendered the drawings – all of them, the paintings and the studies. (See comments for discussion about the actual sales price.) Before DePeyster could breathe a sigh of relief that the deal was closed, Lucy was writing to him again, once more offering the coppers. With no positive response form DePeyster on the coppers, she offered the Ornithological Biographies, which were lying in a barn up in Audubon Park, molding. They had originally sold for a guinea each, but with booksellers in England ignoring her letters, she offered them to the Society for a dollar a volume. DePeyster did not pursue that sale either and with that letter, their correspondence ended. The Lucy Audubon who inhabits the correspondence cited here is quite a different individual from the Lucy Audubon portrayed in Audubon biographies and histories. The self-sacrificing helpmate of the latter is hard to reconcile with the determined and often querulous woman in the former. While the negotiating skills she displays in these letters is admirable, her tone can be irritating and her self-image as the martyred mother, downright annoying. Ultimately, however, she knew what she wanted to accomplish, and like her husband, she understood the value of playing a role. Whichever of these personae is the real Lucy Audubon (and most probably, she was a combination of all ) and whatever her ultimate reasons for selling her husband’s paintings to the New York Historical Society, she deserves the thanks of succeeding generations for conveying her husband’s work to an institution that has cared for it, preserved it, and made it available to the public for 150 years. These excerpts from Lucy Audubon’s correspondence with George Burgess and Frederic DePeyster during her negotiations to sell her husband’s artwork to the NYHS illustrate her negotiating skills as well as her determination and willingness to spin the story to her advantage. Notations in brackets [ ] are explanatory, not original to the text. …I have been thinking that Mr. Bean might know of someone who would like to purchase the Coppers even for less than their value would help me to pay my debts. A little while before Johns death he received a letter from some Sir Henry something Curator of the British Museum in London, saying “if” the Widow of J. J. Audubon would send over the original drawings of Mr. Audubon he would sell them for the Widows benefit better he thought than they would sell in America. All our old and true friends amongst the aristocracy are gone, but there are one or two Persons who were friends all the time we were in England, that I could write to, if you think it a plan likely to succeed. I will not only write to the Curator but to Honable Thomas Liddle who always took great interest in us, and Sir Wm Wood. And if you think it worth while I will have them packed here and a list made of the plates. I perhaps appear impatient and restless to you, but Mr. Burgess it is hard to work all day every day and at the end of a quarter find just enough to pay our Board. I see no way of paying the debts, nor have I even the means of going anywhere. …I still hope to get something worth having from the drawings and Coppers … I will be patient certainly but I cannot be quite passive (? ), I must be trying to help myself out of this great indebtedness … I think Mr. Bien will help me about the drawings and coppers. The drawings 430 at three dollars each all round would be twelve hundred and 90. … Mr. Peters writes me … I will copy what he says truly “I received a note today from Mr. Moore of the Historical Library. He agrees with me that you had better accept any positive offer for them than wait the action of of (sic) a slow corporate body. The Historical Society has not acted, & it will go now a week certainly before they come to any decision. If you can get $4,000 in semiannual payments I would certainly advise you to accept.” … Now if they would pay me one thousand down and the other three each following six months it might help me to clear the mortgage. And the sale of the coppers even by weight … Excuse my writing on half sheets of paper I have no other. The date of Mr. Peter’s letter is Dec. 8 next Monday will be a week. Pray do for me as you think best, I know it is far below their value as works of art, but art is at a very low ebb just now. Mr. Wheelock [Lucy Audubon’s tenant in Audubon Park, who eventually bought the house he leased] knows Mr. Moore intimably (sic). I do hope to be able to pay you and all others soon. …Her present embarrassments have arisen from her liberality toward her sons John & Victor, both now deceased. A large part of the real estate at Washington Heights was sold to pay debts compiled (?) by them in unsuccessful businesses. Other positions (?) were given to them on which they built and raised money by mortgages. Finally, Mrs. Audubon mortgaged her remaining property for $20,000 to enable the late John W. Audubon to prepare (?) and [illegible] of the large birds lithographer. This sum was lost by the breaking out of the present civil war, which necessarily caused a suspension of the publication under way. The interest upon the mortgages together with taxes exceeds the rents, although Mrs. Audubon vacated her own house and took board with the widow of one of her sons. For her own support, consequently Mrs. Audubon was obliged to undertake the teaching of some of the children of the vicinity, assisted by an orphan Grand daughter. This she continued until a few months since, when, at the age of 74, her strength entirely gave way – By parting with one piece of property her indebtedness has been reduced to $12,000. This amount she hopes (?) will further so reduce by the sale of these drawings, so that for the remaining years of her life she may receive a small income & be enabled to provide for the dependents (?) and her grand daughters (? )…The grand daughters of her two sons Victor G. & John W. [Maria Rebecca and Mary Eliza, eldest daughters of John W. and Victor, respectively] are now teaching in the public schools of the 12th Ward. The orphan Grand daughter [Hattie] is giving music lessons to assist in maintaining her Grandmother & self. … It is somewhat singular that my enthusiastic husband struggled to have his labours published in his Country, and could not; and I have struggled to sell his forty years labour and cannot. …To me the months that have passed away since the proposition was first made, have been painful and obliged me to submit again to the payment of an Interest that is truly throwing away my Substance under other circumstances I might now be liberated from my pecuniary embarrassment and England in possession of the Drawings. … Mr Havell’s plan for arranging the Birds I think a good one … I shall not sell them [the Coppers] for less than two thousand dollars simply because a less amount will not finish my much desired object, which is liberation from the mortgages on my former home! …I hope you will not be displeased at the sight of my handwriting again before you…the World is too busy to care for the wants or grievances of an old and lone Widow. I find it impossible to keep the rats from the boxes of the “Ornithological Biography. Posted in Audbuon Park, Audubon, Audubon Park Historic District, Audubon's Aviary, John James Audubon, Lucy Audubon, Minnie's Land, New York Historical Society, Roberta J. M. Olson, Sesquicentennial. Bookmark the permalink. A wonderfully told and most interesting story. Thank you Mr. Spady! This is a fascinating post. I'm a little confused, however, by your statement that Lucy ultimately agreed to sell the paintings to N-YHS for $2,000 (second to last paragraph in the “Lucy Audubon, Negotiator” section). 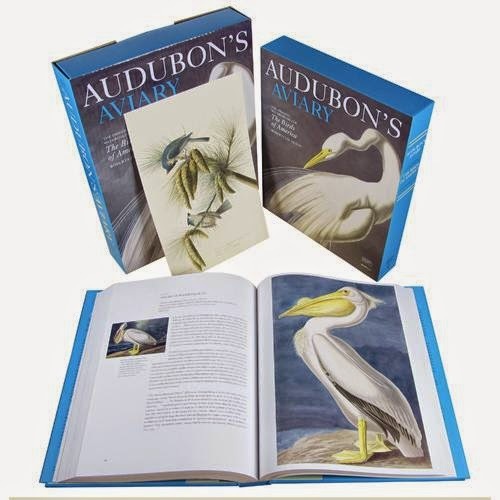 The references I've seen, including Roberta Olson's book AUDUBON'S AVIARY: THE ORIGINAL WATERCOLORS FOR THE BIRDS OF AMERICA (pp. 34-35) all indicate the amount was $4,000. Olson indicates in a footnote (#58 on p. 38) that there is a list in the N-YHS library of individuals who contributed $4,230 toward the $4,000 purchase price. Good point, Leslie (minniesland.com), Our friend Joe Hamrick and I exchanged some email about the same question and then he did some additional research, finding that “Rhodes and Harwood . . .cite the 2K while Fries, Tyler, and Souder . . .cite the 4K.” Joe notes that it's “even stranger still that not ONE of these authors cite their source.” I can't remember whether I picked up the $2k from one of those sources or a letter that Lucy wrote, but I think it was the latter. On the other hand, Dr. Olson has access to records in the N-YHS, which is about as close to the source as you can get. So, why two separate numbers floating around? I can think of a couple of reasons. One is that while the Society may have set out to raise $4K and eventually raised even more, the whole sum may not have gone to Lucy. Part of it could have been reserved for caring for the paintings and storing them. Another option, even more plausible given Lucy's tendency to paint the saddest portrait of herself, is that she received $4k, but chose to say she'd only gotten $2k. After she sold the paintings, she was still looking for buyers for the coppers and several hundred copies of the Ornithological Biographies. Shrewd businesswoman, she was. I looked up two of these references. As Joe said, I found the mysterious $2,000 in Rhodes book with no footnote, but I did actually find something a bit different in Souder. I noticed that he said (on p. 290) that the amount she was paid was “just over $4,000” and that suggested to me the N-YHS as his source. A note for p. 290 (on p. 347) gives the exact amount of $4,230 and cites as his source a 1993 book on Audubon's watercolors (Blaugrund, Annette and Theodore E. Stebbins, editiors. John James Audubon: The Watercolors for The Birds of America, New York: Villard Books and the New-York Historical Society, 1993, p. viii). The statement on the purchase price is part of the preface and is not footnoted, but it says “By June 1863, the committee had managed to collect 4,230 dollars toward the purchase, a remarkable feat considering the difficulties of fund-raising in the midst of the Civil War. With this money, the Historical Society purchased 464 drawings — including those of The Birds of America (acquired for about nine dollars per watercolor) and several unpublished ones.” So we're back to the N-YHS as the source — that's their story and they're sticking to it. I believe that Alexander Adams was the original source of the claim that Lucy sold her husband's drawings to the N-YHS for $2,000. 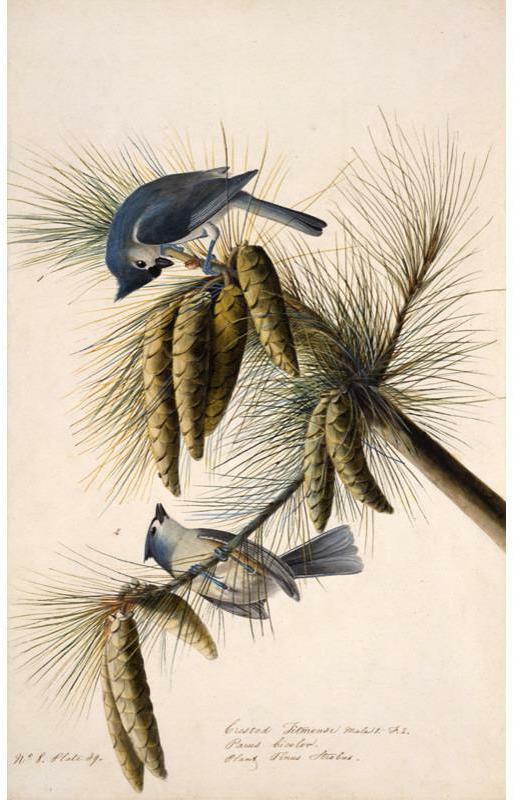 In his 1966 Audubon biography, he wrote: “After months of dickering, she sold most of the original drawings to the New York Historical Society. She originally asked five thousand dollars, then dropped to four, then to two.” (Adams (1966), p. 470). Harwood and Durant repeated this assertion in their “On the Road with John James Audubon” (1980, p. 615). Rhodes evidently relied on one or both of these biographies for his statement. I don't know where Adams got his information (though his notes suggest he had consulted Lucy's correspondence on the matter at the N-YHS (see p. 501)), but he was in error. 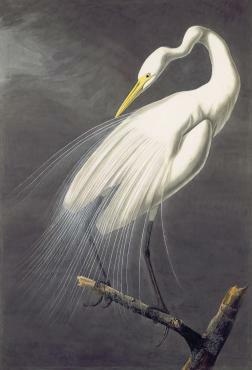 The N-YHS purchased the drawings for $4,000, as Roberta Olson states in “Audubon's Aviary” (2012, p. 35). I have been doing research at the N-YHS for a book on Audubon, and there is a copy of a receipt for this sum in their manuscript collection.